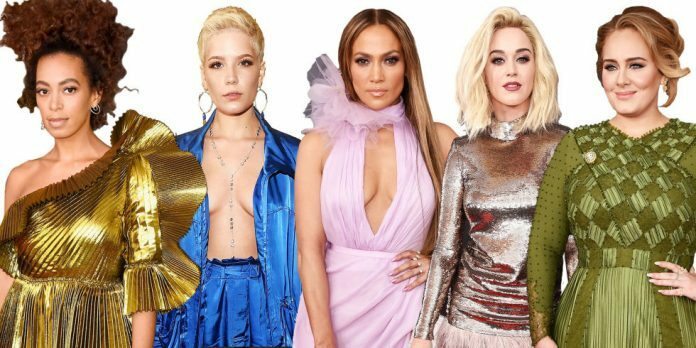 The 59th Annual Grammy Awards 2017, kicked off with some of the biggest names in the industry. Everyone was waiting for Beyoncé to make an appearance since her public announcement of her pregnancy – she showed up with her mother, Tina Knowles, husband rapper Jay Z, daughter Blue Ivy and sister, Solange. 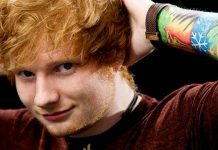 The night belonged to Adele who picked up major awards for her outstanding album, 25. Kanye West and Justin Bieber skipped this year’s awards show, and Selena Gomez didn’t turn up either, though The Weeknd performed with Daft Punk. And Rihanna turned up with a bejeweled flask that she sipped from during the entire ceremony. No doubt the belle of the ball, the Hello singer turned up in a green dress and even performed twice – opening the ceremony and again to perform a tribute to the late George Michael. The former Fifth Harmony star made her first solo appearance on the red carpet in this princess-like ensemble. The former Grammy award winner looked stunning in this all-red gown with a cutout and closed collar. She performed with fellow country Keith Urban in the course of the evening. 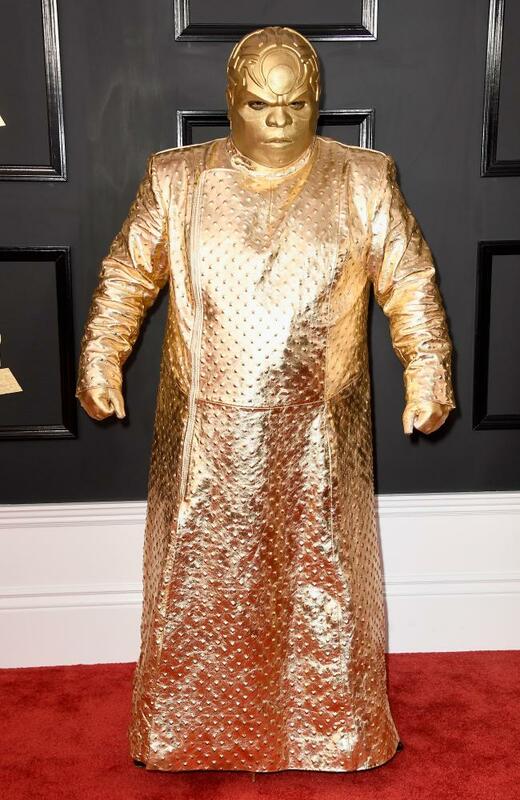 The rap artist turned up in a golden avatar which made social media assume that he’s going all C3PO on everybody! The angelic French-Canadian legendary singer made her first solo appearance on the red carpet since the death of her husband last year. She was warm and shared a few words with Lady Gaga and Adele at different points in the evening. The pop singer turned up in this Valentine’s Day ensemble – a red gown with a sweetheart neckline. The soulful singer and his former model wife hit the red carpet, looking great together as usual. John later performed with Neil Diamond and as part of a tribute to the late Prince. The former Disney star looked fierce in this cutout beige dress with gold embellishments. She also performed as part of a tribute to the Bee Gees. The Closer collaborator looked gorgeous in this open blue jacket and matching pants while on the red carpet. The Carpool Karaoke host was one of the first to hit the red carpet as he was also hosting the evening. 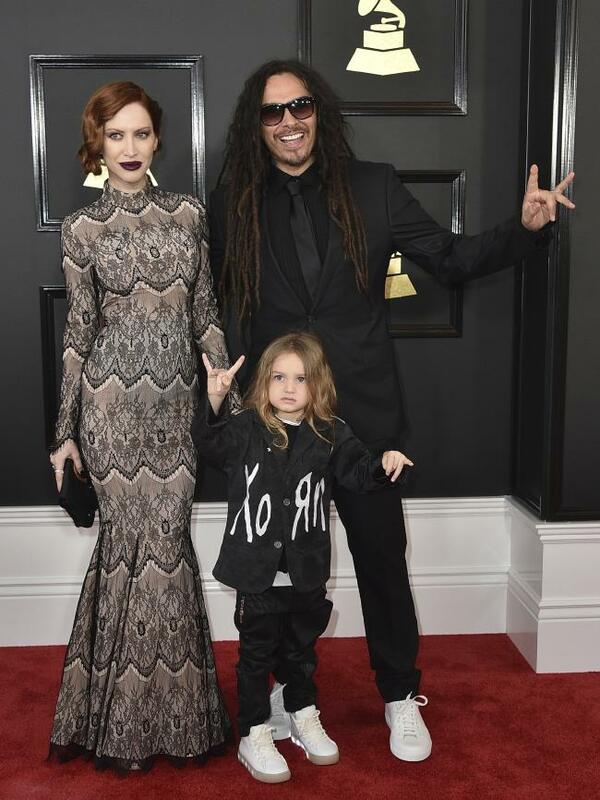 The Korn member turned up with his wife, European model Evis X Shaffer and son, D’Angelo Shaffer. The sultry Latino singer looked flawless, as usual in this purple dress with a thigh-high slit. 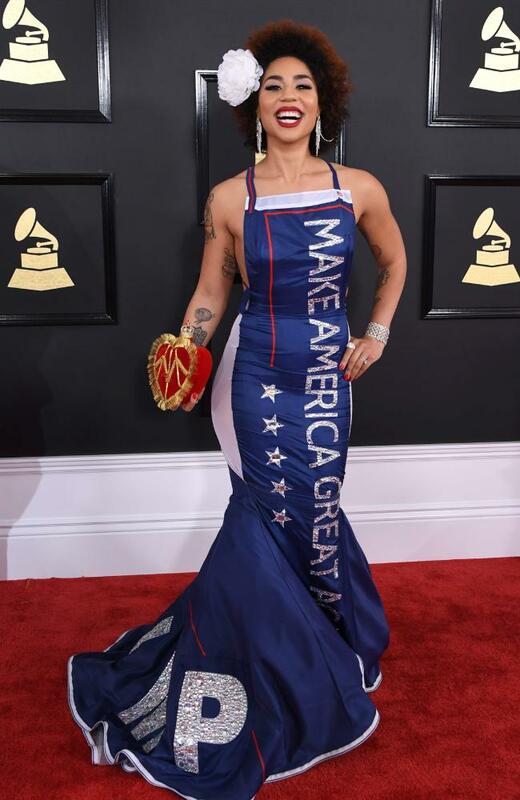 The relatively unknown singer made a bold political statement by wrapping herself in Donald Trump’s glory words for his campaign to the Presidency: Make America Great Again. The pop singer debuted her new platinum hair, but still showed her old catty attitude when she made a jibe at Britney Spears’ public meltdown. She also lip-synced her performance with Skip Marley for her new single, Chained To The Rhythm. Mother Monster was bold and fierce on the red carpet, showing serious underboob and a new moth tattoo as she performed with metal legends, Metallica. 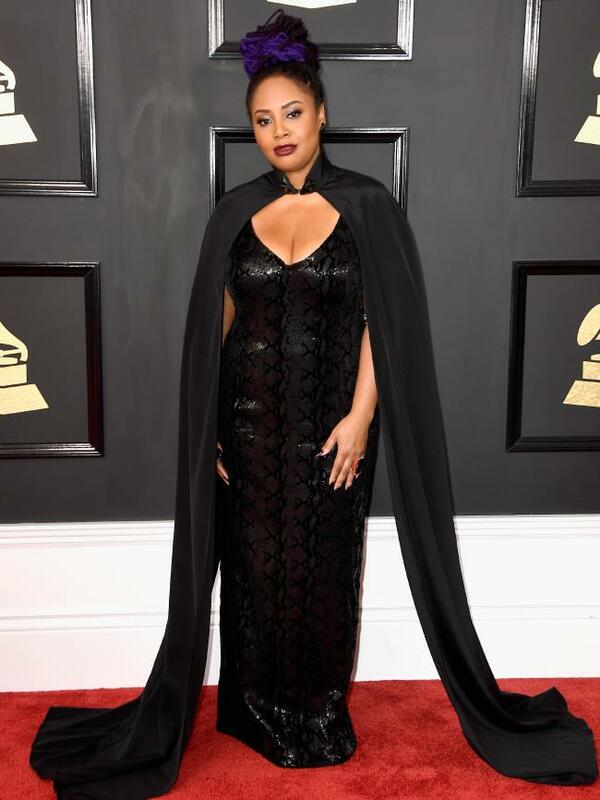 The multi-Grammy award winner looked beautiful in a black dress with purple hair and a matching cape. The former Glee star turned up in this crocheted black dress. The multi-Grammy award country singer looked beautiful in a lace purple dress with a matching train. The metal legends hit the red carpet (from L-R: Robert Trujillo, Kirk Hammett, James Hetfield and Lars Ulrich) and performed later with Lady Gaga, though they faced technical issues. The former Camp Rock star wore an all-black ensemble with a studded jacket. The daughter of King of Pop, Michael Jackson came out to bring to focus the ongoing DAPL issue and was cheered on by the crowd. She designed the dress she wore that evening. The Bajan beauty attended the event with flask in hand, though she didn’t win any award, she did cheer on everyone who took home a Grammy that night. The veteran singer looked serious in this white shirt-dress. 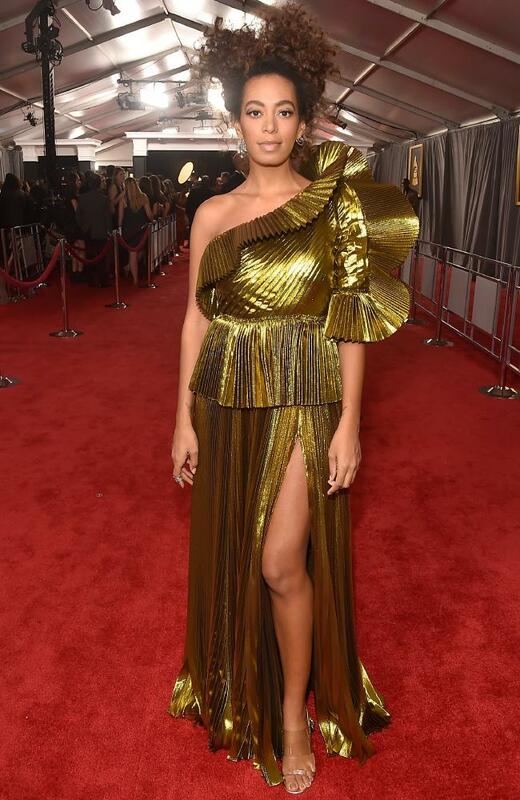 The younger sister of Beyoncè and also award winner for the night looked beautiful in this off-shoulder dark gold gown. 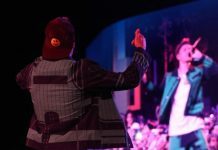 The country music legends couldn’t keep off each other and danced and performed as part of the audience throughout the night. The former American Idol star looked beautiful in this emerald green off-shoulder dress, and even performed with Demi Lovato for the Bee Gees tribute. 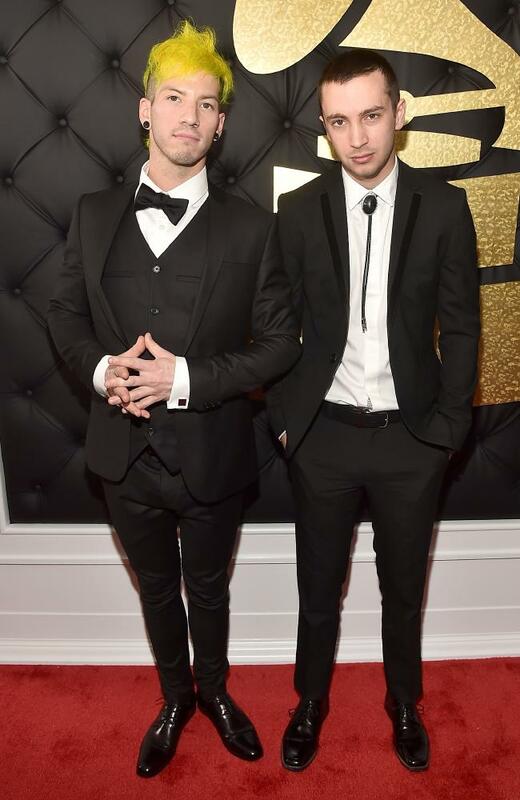 They took off their pants as they went to receive their first Grammy win, and inspired us all with their simplicity and wisdom.